U.S. Evangelicals Push Back Against Trump's Syria Pullout Plan Christian leaders in the U.S. fear President Trump's decision to pull out of Syria will leave Christian minorities in the region vulnerable to attack. 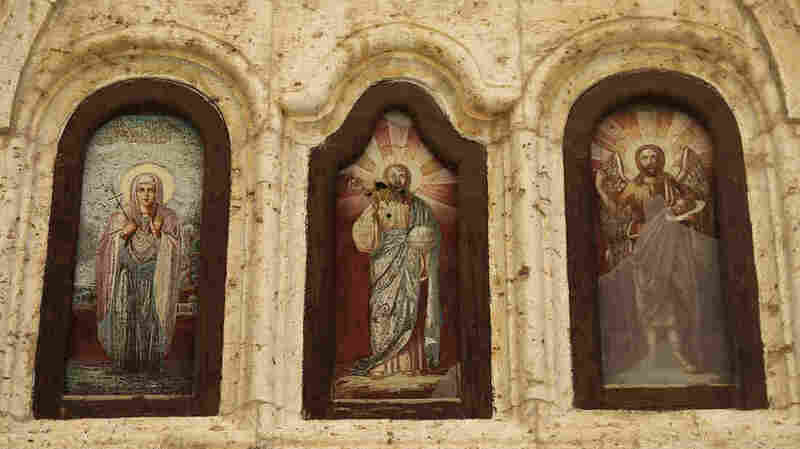 Christian icons damaged by fighting are seen in a monastery in the village of Maaloula, north of Damascus, Syria. U.S. evangelicals are concerned that a pullout of U.S. troops will leave Syrian Christians vulnerable to attack. Among the groups criticizing Trump's Syria plan is the Family Research Council, a conservative evangelical organization with a mission of advancing "faith, family, and freedom in public policy and the culture from a Christian worldview." In the past, the group has actively supported Christians overseas who face persecution. In a statement on its website, two senior officials of the organization wrote that a withdrawal of U.S. troops from northern Syria could put Syrian Christians "in mortal danger" and deal "an incalculable blow ... to our reputation as a supporter of religious freedom worldwide. " One of the authors, Lt. Gen. (Ret.) William G. Boykin, said last year that "God's imprint" was evident in Trump's election. But in a Fox News interview last month, Boykin warned that Trump was "on dangerous ground" with his Syria plans. Critics of the U.S. withdrawal say it could mean Turkey will be tempted to send troops and allied Syrian Arab forces into northern Syria, where they could attack ethnic and religious minority groups, including Yazidis, Kurds, and Syriac Christians, an ancient Christian community that still speaks Aramaic, the language of Jesus. Those worries were echoed last week by the Christian Broadcasting Network (CBN), founded by conservative televangelist Pat Robertson. "For President Donald Trump, pulling U.S. troops out of Syria fits neatly into his 'America First' foreign policy," noted CBN White House Correspondent Jennifer Wishon. "But as the U.S. prepares to draw down," she said, "Syrian Christians fear they'll be wiped out. It appears U.S. policy has the potential to put 2000 years of Christian tradition and history at risk." Rarely have CBN journalists assessed Trump Administration plans so harshly. [A]s the U.S. prepares to draw down, Syrian Christians fear they'll be wiped out. It appears U.S. policy has the potential to put 2000 years of Christian tradition and history at risk. Joining the chorus of concern over the fate of Syrian Christians is the organization Open Doors, which tracks the persecution of Christians around the world. In its 2019 "World Watch List," released Wednesday, the organization reported that violence against Christians in areas of Syria held by rebel forces spiked over the last year. "Left to protect themselves, Christians will become extinct," says Open Doors CEO David Curry. "So we're going to need the U.S. or others to protect those religious minorities, or you're going to have continued genocide." Religious minorities in Turkey and Syria have long faced hostility from Turkish forces, and the Christian population in Syria today fears a repeat of previous massacres, according to Bassam Ishak, president of the Syriac National Council of Syria. "They worry about Turkey coming in, because of what Turkey did to their parents and grandparents 100 years ago," Ishak says, referring to what is generally known as the Assyrian genocide. Ishak, who lives in the United States but returns regularly to northern Syria, was in neighboring Iraq last month when President Trump announced his Syria pullout plan. "I was getting calls from Syriac Christians and from Kurds who were worried," Ishak says. "They wanted to know what's happening and if I had any information about the situation. They were desperate." When Turkish troops and allied rebel forces early last year entered the city of Afrin, a largely Kurdish enclave in northern Syria, they reportedly engaged in looting and desecrated Kurdish monuments. Up to 100,000 Kurdish fighters and Afrin residents, including Christians and Yazidis, fled east to parts of northern Syria under the protection of U.S. troops. Turkish officials say their forces do not target Kurdish civilians, only Kurdish militia groups that they hold responsible for attacks inside Turkey. President Trump and his national security adviser, John Bolton, have repeatedly warned the Turkish government that any similar incidents following a U.S. pullout would have serious consequences, but Turkish President Recep Tayyip Erdogan has largely brushed the U.S. concerns aside. "So far, the Turkish government has failed to provide additional guarantees," says Aykan Erdemir, a former opposition member of the Turkish Parliament and now a senior fellow at the Foundation for Defense of Democracies. "It has failed to recognizing its shortcomings in Afrin, and it has not given any assurances to the Syriac Christians, to the Yazidis, or to the Kurds of the region." Erdemir says there is particular concern over the fate of the small but growing community of Kurdish Christians, many of whom are evangelicals. Recently, they have been a target of Turkish government propaganda. "We see conspiracy theories about a global push to establish a Christian Kurdish state, Erdemir says, "which is of course nonsense." Those conspiracy theories were part of the background to the two-year imprisonment in Turkey of U.S. pastor Andrew Brunson, who was released in October 2018 following an intensive campaign by U.S. evangelical leaders. Given the circumstances, a U.S. pullout from northern Syria could bring "a horrible situation," says Ishak, the Syriac Christian leader. "As soon as people hear that Turkish forces or their Syrian rebel allies are coming, the Christians will start fleeing."